When getting the stove going, we all know that you start with some crumbled up newspaper, and some small kindling wood. Sometimes, when I tryed to light the stove,the newspaper would burn up, and if the bits of wood weren't small enough, it would smoulder and go out. 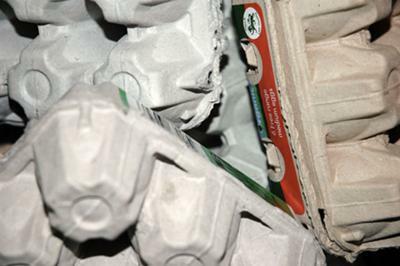 One item I found that really gets the fire going quickly is empty egg cartons. A little crumbled newspaper, an empty egg carton, and a few pieces of kindling, and it's off! I save empty cartons, open them up, and stack them until I need them. They take up little room, and really make a difference. Get your friends or relatives who don't use wood stoves to save them for you. Thanks for recommending this one - it really is a great tip, and far more effective than trying to light a fire with newspaper! Newspaper is fully of clay particles which hinder burning and then leave a great big ball of ash. If you've watched a ball of newspaper smoulder you wil have seen this. The ash itself restricts air flow and has an overall hindering effect on the fire, as it blocks heat and air from reaching your kindling. Cardboard doesn't seem to be quite so bad for this, and tends to burn much more easily and with more heat.